FSX/P3D/FS2004 Synthetic ILS - for every runway at every airport in the Flight Simulator database, also for FS2004 and P3D AILA - Airborn Instrument Landing Approach system . Instrument enables selection of any of the 24,491 Airports that exist in Flt Sim database , then selection of any Runway at that Airport, then selection of either Rwy end. Airports can be selected at any global distance from aircraft. Distance Bearing and Steering arrow are displayed,the ILS aimpoint is computed at 6% of relevant Runway length and the ILS is full precision with usual ILS Deviation bars text data includes current, Glideslope, Height above Runway, Distance to touchdown aimpoint, offset (Circuit Width)from Runway centerline,full Airport name and details , enables precise rectangular standard circuits to be flown , also enables an Intercept position to be set at any desired distance prior to ILS aimpoint to easily align aircraft with the Runway. 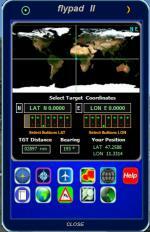 Also includes MARK POSITION capture of any location on earth and generation of a Synthetic Runway, ie. a paddock,a beach, a river, lake, sea, hardened rooftop or bridge, and subsequent ILS approach at that location. the default ILS Glideslope is the usual 3.00 degrees but any angle can be set. Can be used in any aircraft, Helicopter, cropduster, float plane, or fire fighting aircraft. 16 page notes PDF, an Airports ICAO PDF, and several descriptive screenshots. By Karol Chlebowski. These FIPs consolidate some of my earlier FIPs for the default B58, into a cluster of 3 FIPs which together, will provide most of the interactivity for flying the default B58. Engine gauges, fuel pumps and other switches are contained within 1 FIP, another provides the avionics and the third has the AP, fuel gauges, landing gear lights, flaps indication lights and some electrical gauges. The engines gauge also has fuel tanks selector needles and a basic glidescope indicator included for use with NAV1. Airbus A319 revised cockpit missing gauges. This file contains missing gauges for the revised VC by Bjoern Kesten. A319FD-FMC.CAB and VCRain.CAB. Simply unzip and put files into panel folder of your aircraft. Activation with a klick: Exits 1-4, Tailhook, Wing fold, Jetway, Pushback (left, straight and right) Only tested in FSX & Acceleration! Intended for aircraft, which have in real an APU but was not simulated in FSX or for smaller aircraft that they have at least external power! Please take a look into the "Read me" file before installing! Tested only in FSX + Acceleration! If you ever wanted to have something similar to the Garmin GPS in the cockpits of the A321, 737, 747 or CRJ700 then this addon is for you. What this addon does is add a touch screen gps right in the virtual cockpits of some of the default aircraft in FSX. This is good if you want to be able to view the GPS route in your 3D virtual cockpit without opening the 2D GPS panel and blocking part of your screen. 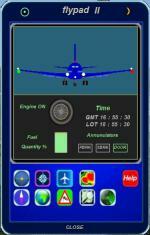 This addon only supports aircraft with a multi function display. Airbus A321 Boeing 737-800 Boeing 747-400 Bombardier CRJ700 It replaces the useless navigation display with a fully working gps! This package contains all necessary files to add a GPWS callout (500, 200, etc) sounds on an existing aircraft. Please Follow instructions in the readme.txt file. This is a tutorial that explains how to create a gauge for Saitek FIP, 75 pages. The file contains all Key events to manage buttons and knobs.